Buying a smartphone nowadays can bring you in a soup as there is a wide range of smartphone manufacturing company offering numerous handsets both online & offline. Amongst all the price ranges, manufacturers are particularly targeting the under 15k bracket. 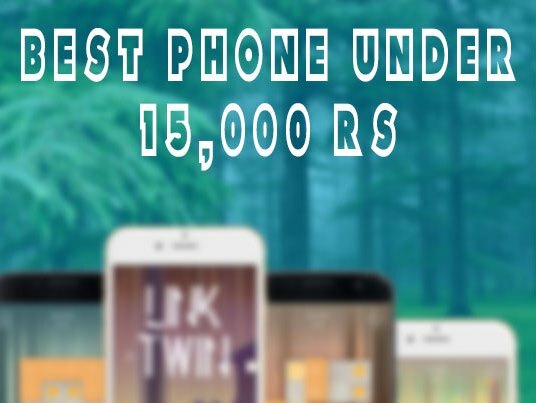 As most customers would willingly spend 15000 for their smartphone as most of them are powerful, fast, has premium look & have some cooler additional features as well.Some smartphones under 15k range are so accurately manufactured that they can give premium flagship phones a tough competition. In the last few years, companies like Motorola, Xiaomi, and Lenovo have completely redefined the definition of budget smartphones. Smartphones under Rs 15,00 now come with great cameras, premium metal designs, and solid build quality. If there is one handset manufacturer which can be termed as the undisputed king of the mid-range smartphone without even compromising on quality & performance then it has to be Moto. The Moto G5 changed the trend of it’s predecessor G series phone in terms of design as the phone is completely metal build, unlike all other G series phone which was made of plastic. The Moto G5 Plus comes with a 5.2-inch fullHD display protected by Corning Gorilla Glass 3, Android 7.0 Nougat out of the box and 16GB of internal storage which can be expanded via a microSD card (of up to 256GB). It runs on 1.4 GHz Qualcomm Snapdragon 430 octa-core processor. Talking about the camera the 13 MP camera on Moto G5 includes phase detection autofocus (PDAF), which enables fast focusing for sharper pictures. There is 5 MP wide-angle lens in the front. The Moto G5 comes with a water-repellent coating which offers basic protection against spills and rain drops and also has Google Assistant on board. The smartphone is available for Rs 11,999 and makes for an excellent buy thanks to its premium design, clean Android experience, and a great camera. Xiaomi is known to not dig deep in your pocket but hand you a powerful yet stylish handset. The company delivers this standard yet again by packing 4GB RAM, 64 GB ROM with Qualcomm SD 625 in a 5.5 inch full HD display handset that too in just 12,999 on Flipkart. On the imaging front, the smartphone comes with a 13MP rear camera with phase detection auto focus and an aperture of f/2.0. The rear camera lens has a 25% larger pixel area as compared to the Redmi Note 3 and is sourced from Samsung and Sony. On the front, there is a 5MP camera with a 85 degree wide-angle lens.The phone has a hybrid sim slot with expandable storage up to 128 GB.The phone runs on Android Marshmallow 6.0.1 & has a 4100 mah battery which lasts a full day under normal use. Overall the Redmi Note 4 not only lives up to the legacy left by its extremely popular and acclaimed predecessor but also builds upon it in significant ways. It makes for an excellent budget smartphone thanks to its premium build, outstanding battery life, competitive pricing and above average performance. A smartphone with dual rear camera (12MP+2MP) with front camera 8MP with a price tag of 12,999. Ever heard of this? Chinese handset maker Huawei fairly a new entrant in Indian market trying to make a footprint here by offering dual rear camera which can click good pictures along with 3GB RAM. Additionally, the device has 5.5-inch LCD screen with 1920 x 1080 pixels resolution. The phone runs on Android v 6.0.1 Marshmallow operating system with 2.1GHz + 1.7GHz Kirin 655 octa core processor. Honor 6X comes with 32GB internal memory expandable up to 128GB and dual-SIM dual-standby (4G+4G) with VoLte support 3340mAH lithium-polymer battery providing talk-time of 23 hours and standby time of 650 hours. The dual rear camera on board Honor 6X distinguishes this phone amongst all in the camera segment. Initially launched at Rs.17,999 now the makers has decided to slash the price of this device & is available for 14,999 online. With 3GB RAM,32 GB ROM powered by a Qualcomm SD 820 processor & 3500 Li-ion battery this 5 inch full HD display mobile is giving a cut throat competition to all the mobile in this price bracket. The 13 MP rear camera with 8 MP in the front can click decent pictures provided with ambient light source. The smartphone comes with a nearly stock version of Android out of the box. There is a fingerprint sensor embedded into the home button which can be used to perform several quick tasks such as invoking Google Now and opening the app switcher. If there is a company who had kept the style quotient high for budget smartphones then it has to be the LeEco. Keeping in line with the predecessor the LeEco Le 2 packs a punch with a stylish 5.5 inch full HD display LCD screen with a 10 point multitouch & Gorilla Glass 3 looks sheer elegance in first look. Performance wise Le 2 is build with a powerful Qualcomm SD 652 processor.It has a 3GB RAM,32 GB ROM & 3000 mAh Li-ion. The Le 2 features a design similar to its predecessor with a metal body and stellar build quality. The LeEco Le 2 comes with a 16MP rear camera with an aperture of f/2.0 rear camera, a dual LED flash and a sensor size of 1/31″ inches. On the front, there is an 8MP sensor with an aperture of f/2.2. LeEco’s content ecosystem offers users access to 2,000+ movies, 50 live concerts throughout the year, 100+ live TV channels and more than 3.5 million songs right from their smartphone. A rather controversial feature of the LeEco Le 2 is its lack of a 3.5mm headphone jack. It uses CDLA technology to transmit audio through the smartphone’s USB-Type C port. The company claims that this results in the transmission having a higher bit rate, more power, and lesser signal noise, thereby providing high resolution, nearly lossless audio.